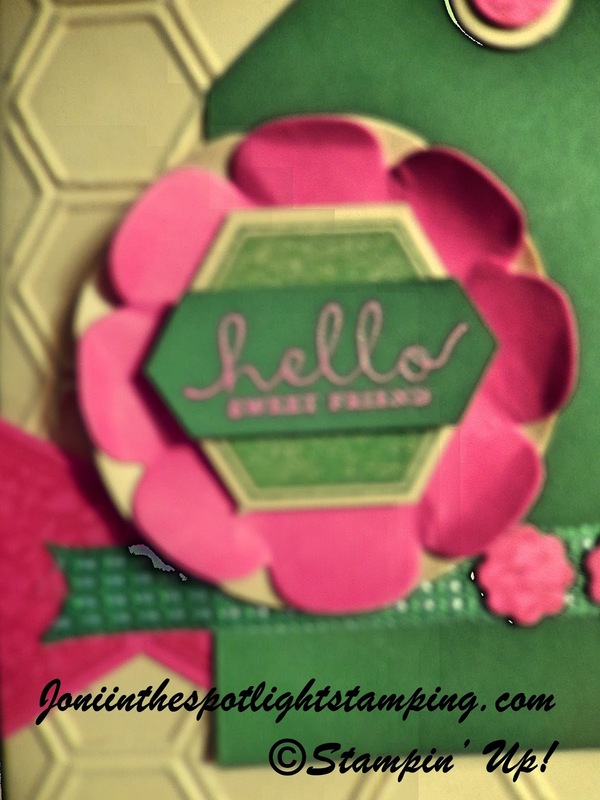 Joni in the Spotlight Stamping: COLORING WITH GUMBALL MOJO!! So maybe you've "gumballed" over from Amanda's blog? Maybe you'll "gumball" over to Laura's blog when you're done! Either way, lots of good stuff to look at on this "roll"! Ok, I'll stop with the puns now!!! lol I crack myself up! Combining challenges again this week! I'm using the Mojo Monday 332 sketch to create our hop card (see sketch below!)!!! Lovin' these colors because I'm officially DONE with winter!!!! The "green" makes me think spring! The flower is cut using the Floral Frames Framelits. I curled the edges with my Bone Folder. Adds a little extra dimension! I apparently was feeling hexagonal, because I used the Honeycomb embossing folder, the Six-Sided Sampler Stamp set, and the Hexagon Punch! Hmm. Throw in a little Stitched Satin Ribbon & a few Itty Bitty Punch Pack pieces & it makes a cute card! Oh, here's the Mojo Monday sketch that I used! So keep "rolling" with our gumballs this week! It's a great hop week!!! I'm with you, Joni. I'm so DONE with winter, and we are expecting 10-12 inches tonight. Ugh! So I love your bright colors, and I'm looking forward to some flowers!! !